Blake Griffin says he’s taking his availability for the Pistons playoff series with Milwaukee on a day-to-day basis. 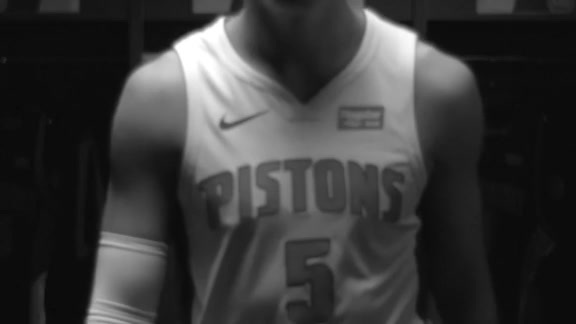 AUBURN HILLS – If you’re looking for clues as to whether Blake Griffin’s name will be called in the starting lineup when the Pistons open the playoffs at Milwaukee on Sunday, he’s not the one dropping any bread crumbs. If the game were tonight, he was asked, would he be able to play? His teammates, though, paint a more vivid picture of the situation with Griffin’s sore left knee, which caused him to miss four of the season’s final seven games – including the playoff-clinching win at New York on Wednesday in the regular-season finale. Griffin shot free throws after Friday’s practice when media members were allowed in to their practice facility, but none of the typical post-practice shooting or individual work. On Saturday, he was seen only on the exercise bike while his teammates completed their shooting drills. Griffin missed the three games following a big March 28 win over Orlando when his knee issue first flared. He returned to score 45 points in an April 5 loss at Oklahoma City but struggled noticeably to move laterally or jump two days later when the Pistons lost to Charlotte. In Tuesday’s home finale, when the Pistons rallied from a 19-point halftime deficit to beat Memphis, Griffin left after less than four minutes of the second half, then was made inactive for the win over the Knicks to get the Pistons to 41-41 and earn the No. 8 seed. He was asked whether it was “bittersweet” to miss that win after carrying the Pistons while averaging a career-high 24.5 points over the course of the season. But uncertain they’ll have everyone they want – and need – in uniform when the franchise’s first playoff appearance in three years gets rolling against the team with the NBA’s best record.